At 15 years old, Harold Cotton tucked his shoe shine box under his arm and walked to Jefferson Square in downtown Greensboro, North Carolina. The year was 1937 and the Depression had thrown most of the black men in town out of work. Those lucky enough to find employment would toil all day and might earn a dollar. If business was good that day, Cotton might shine 40 pairs of shoes at a nickel a pair and clear two dollars or more including tips. At 6 p.m. that day, after the downtown crowds had gone home, Cotton stopped in at the recently opened Bob’s Hat Shop at 108 McGee Street, hoping to meet his cousin. However, Cotton met Robert Taylor instead. In jest, Cotton asked Taylor for a job. The older man asked, “Well, can you shine shoes?” As Taylor sat in a chair at the back of the store, Cotton proved his skill with rag and brush. Taylor offered him a job that same night. Bob’s Hat Shop offered shoe shines along with hat cleaning and repair and was the only black-owned business allowed to operate downtown. To survive on this side of the city’s color line in the 1930s meant that Taylor had to keep his own store segregated. While black customers could get their shoes shined at Bob’s, they had to sit on a chair in the back of the shop. Only white patrons could sit on the chairs in the front of the store. For the next decade, Cotton worked part time shining shoes at Bob’s Hat Shop while also holding down jobs at the El Moro Cigar factory and the Cone Mills, as well as driving a delivery truck. Even after returning from World War II and attending North Carolina Agricultural & Technical College, Cotton continued to work at the store until Taylor’s death in 1948. With Taylor gone, Cotton joined the Great Migration of millions of African Americans leaving the South after World War II for better opportunities in the North. With an eye toward opening his own store in Chicago, he enrolled in the Chicago School of Shoe Rebuilding in 1950, earning his degree in hat cleaning and repair. Soon afterwards, Cotton received a long-distance phone call from North Carolina. The man who had bought Bob’s Hat Shop was gravely ill and his sister needed someone familiar with the business who could also clean and repair hats. Eventually, the sister let Cotton take over the payments, and by 1953, Cotton had taken possession of the business free and clear. However, the 1960s signaled a dramatic shift in men’s fashion. Though apocryphal, the widespread story that President John F. Kennedy delivered his inaugural address bareheaded nonetheless signaled the beginning of the end for the dress hat. Then, as Cotton remembered, “the hippies came along,” and “stop[ped] wearing hats and started wearing long hair ... and then everyone started going bareheaded.” Though business was never again as good as it had been in the 1950s, Bob’s Hat Shop would remain a fixture in downtown Greensboro for the rest of the century. The 1960s also saw profound challenges to the system of Jim Crow that had placed hard limits on the freedoms and ambitions of African Americans across the South. On February 1, 1960, four students from North Carolina Agricultural and Technical State University staged a sit-in protest at the segregated Woolworth’s lunch counter less than half a mile away from Bob’s Hat Shop on South Elm Street. The protesters' refusal to obey an unjust law created a disruption so massive that it compelled Woolworth’s to desegregate its southern stores. By the end of 1960 more than 70,000 brave young men and women sat in, faced arrest, and endured violence in their campaign to desegregate hotels, libraries, parks, and lunch counters across the South. While the protests targeting the Woolworth’s down the street were escalating, an African American Marine walked into Bob’s Hat Shop and asked for a shine. In that moment, with history being made up the street, Cotton made the decision to desegregate his store. He told the soldier to have a seat—in one of the chairs reserved for white customers only. After his customer paid the bill and left, Cotton turned to an understandably stunned friend and announced that “from now on anybody that comes in here can get on the stand. I don’t care whether they close us up or not.” To desegregate his store in 1960, when the successes of the civil rights movement were still uncertain, took considerable courage. The landscape of the past is studded with the graves of men and women who had similarly challenged Jim Crow. Not all of Cotton’s contributions to the cause of African American civil rights were as dramatic as his decision to desegregate his shop. In the era of Jim Crow, segregation often meant that African Americans were taxed to build parks they could not play in, pools they could not swim in, and schools their children could not attend. Though there were segregated schools black students could attend across the South, these were underfunded, overcrowded, and would be closed as needed in the event of a shortfall in the annual budget. If African Americans wanted any of these things for their own communities, they had to pay for it themselves. That is, after paying taxes for all the amenities that white people enjoyed but they themselves were barred from using, black communities taxed themselves again. They used these “second taxes” to build their own schools, their own parks, their own playgrounds. 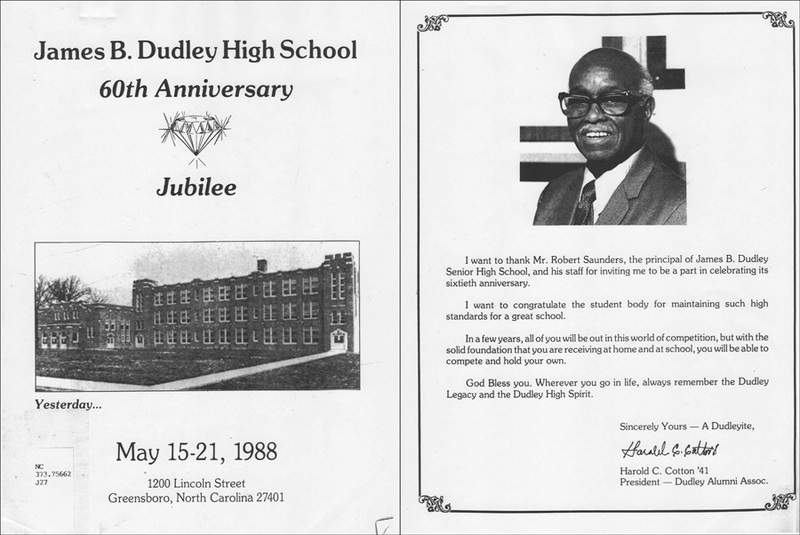 Over the course of the next half century, Cotton also paid his “second taxes.” The profits from Bob’s Hat Shop helped sustain many of the the institutions of the local black community: St. Stephen's United Church of Christ, the local black Boy Scout troop, the Dudley High School Alumni Association, and the Greensboro branch of the National Association for the Advancement of Colored People. Contributions like these from thousands of black business owners paid for textbooks, teachers’ salaries, even the coal used to heat schoolrooms in winter. Their contribution meant the difference between literacy and illiteracy for millions of African Americans. The bedrock of the local economy of African American communities in towns like Greensboro comprised of small business owners and entrepreneurs like Robert Taylor and Harold Cotton. The overlooked and unseen labor of the black proprietors of hat shops, beauty salons, funeral parlors, photography studios, barbershops, and other businesses performed the yeoman’s work of sustaining the African American community through the decades of Jim Crow. Harold Cotton's story is one of two biographies featured in Black Main Street: Funding Civil Rights in Jim Crow America, a temporary display within the American Enterprise exhibition's "New Perspectives" case, on view from September 16, 2016 through March 8, 2017. Jay Driskell is a historian of the urbanizing, segregating South. He is the author of Schooling Jim Crow: the Fight for Atlanta’s Booker T. Washington High School and the Roots of Black Protest Politics.